Many people who come on our walking holidays in Europe and Australia enthuse about our picnic lunches and often ask us for our salad recipes and picnic soup ideas. This page provides a reference to some of our favourite recipes and will be updated and added to with time and the seasons, so we hope that regular visits to the page will keep you inspired with some tasty results! In a pan stir fry briefly one finely diced red onion, 10 black cabbage or kale leaves, and 300 gr of diced pumpkin. Add salt and very little water and cook until soft on high heat, adding water in small amount if needed. Add it to the rice. Chop 200 gr of sundried tomatoes, 200 gr of grilled bell peppers (if you don't have time you can use the pickled ones) and add them to the salad, along with some cooked chickpeas. Season the salad with basil pesto to taste before coarsly chopping 200 gr of hazelnuts, toasted in a pan, to sprinkle on top for a bit of crunch! Please note: with this many ingredients it is difficult to make small quantities of this salad. It's ideal for dinner parties or weekly meal prepping, and it's better to prepare it one or two days ahead of time to let the flavours develop. Pour three tablespoon of extra virgin olive oil in a tall sauce pan. Chop a leek and fry it slightly. Dice two big potatoes and cover with water (or chicken stock, or vegetable stock). When it starts to boil toss in four big zucchini (diced) and add rock salt. You can add some croutons if you like. These quantities should suffice for four people. Chop the herbs, parmesan and pine nuts. In a large mixing bowl mix all the ingredients until you have an elastic dough. Make the dough into a ball and rest it in the fridge for 20 mins. Cover a baking sheet with baking paper and heat the oven to 180 degrees (fan oven). Take a small piece of dough and roll it in your hand to make a ring shape, and lay on the baking sheet. Brush all the tarallini with cold water and bake for 30/35 mins until they are golden in colour. Cool on a rack and enjoy with an aperitivo! 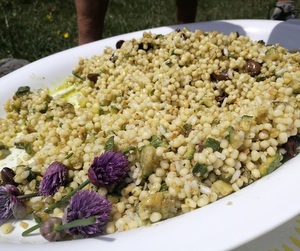 This is a super-easy and super-tasty salad which Cinzia made in Piedmont with couscous, but it would work well with any cooked grain. The other ingredients are a good-quality pesto, taggiasche olives, cubed zucchini fried in oil and garlic and toasted hazelnuts. Season to taste with salt and freshly ground black pepper. This recipe for yoghurt rhubarb cake was a real favourite whilst hiking on Mount Buffalo just this year. We found the recipe on the Taste magazine website and it was written by Kerrie Sun. Preheat oven to 180°C. Brush a square 22cm (base measurement) cake pan with melted butter to grease. Line base and sides with non-stick baking paper. Combine rhubarb and 55g (1/4 cup) of the sugar in a baking dish. Cook, covered, in oven for 20 minutes or until tender. Remove from oven and set aside to cool. Use an electric beater to beat together butter, remaining sugar and vanilla in a bowl until pale and creamy. Add eggs, 1 at a time, beating well after each addition until well combined. Stir in flour, yoghurt and milk until combined. Spoon half the mixture evenly over the base of prepared pan. Top with rhubarb. Spoon over remaining mixture and smooth surface. Combine brown sugar, cinnamon and almonds in a bowl. 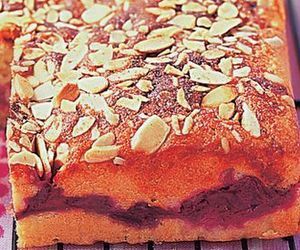 Sprinkle cake with almond mixture. Bake in oven for 40-45 minutes or until a skewer inserted into the centre comes out clean. Remove from oven. Set aside for 5 minutes before turning onto a wire rack to cool. This is a simple recipe which was another real hit on our Highlights of Mount Buffalo weekend in March 2017, and these quantities will feed between 4-6 people. Toast the sesame seeds on a baking tray in a pre-heated oven at 180 degrees until they are golden brown. Make the dressing by mixing together the coconut milk, chilli and lime zest and juice. 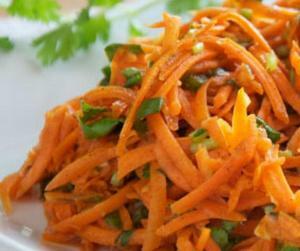 Add the grated carrot to the coriander and sesame seeds with the dressing and mix thoroughly. Wash the zucchini and slice them thinly and salt them lightly. Take a baking dish and add a little oil. Now pass some zucchini slices in flour and place them in the baking dish. (If you want, you can fry or grill them before the following process! If you fry them, first you pass the zucchini in flour and beaten eggs and then you fry them; if you grill them, first brush them a bit with oil and then grill). 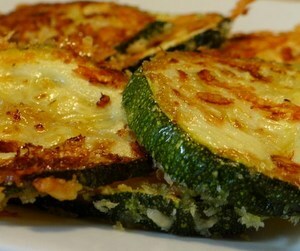 Cover the first layer of zucchini with ham (optional), then slices of emmental cheese and mozzarella or scamorza. Sprinkle with a handful of grated cheese and chopped parsley, and start to arrange other slices of zucchini as before until the end of the ingredients. Of course the last layer must be of cheese. Sprinkle with more grated cheese and a little extra olive oil and bake in oven at 200 ° for 30 minutes or at least until the surface forms a delicious golden crust. Take out of the oven and let it cool a little before serving your white zucchini parmigiana. The area around Santo Stefano in the Apennine mountains where we hike on our Wilds of Abruzzo tour is famous for its lentils. 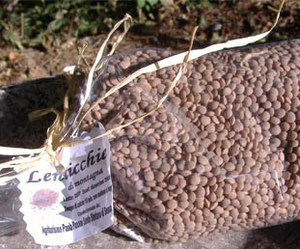 Lentils are hardy plants which can survive the harsh mountain conditions and are full of vitamins, iron and protein. Their small pods usually contain between two to four of the lens-shaped legumes. We were given the recipe for a classic local lentil soup by Liliana in the agriturismo "Al Borgo" where we eat with our groups on the tour and it couldn't be simpler. Heat five or six whole cloves of garlic in a little oil, add the Santo Stefano lentils and cover with water. Add a slice of pork fat and a thick slice of pancetta and several bay leaves to the liquid and bring to the boil and then simmer for around 40 minutes. The pork fat slowly dissolves, so remove any remnants before serving, but its addition gives a wonderful flavour to the broth. You can add a little extra water if required during the cooking time. Another of Cinzia' recipes and very easy to do. Drain the tuna, and put it in a salad bowl. Add the datterini tomatoes cut in halves, the white sweet onion sliced very thinly and the olives roughly drained from their oil. Use the oil from the olives, add 1 tbsp of wine vinegar and a pinch of salt if necessary. Dress the salad, mix all the ingredients together. Slice the eggs in quarters then put them on top of the tuna mix. Sprinkle with the herbs and enjoy. Will serve 4-6 people. This recipe belongs to Cinzia and she made it on our Jewels of Piedmont tour. Slice the onion very thinly. Heat 2tblsp of oil in a large frying pan or a wok. Fry the onion until translucent. Add the peppers cut in long strips (smaller is better than bigger) and let it fry for 5 mins. Add 3 or 4 tblsp of apple vinegar according to the strengh of the vinegar. Add 1 tbsp of sugar or honey if you prefer. Season to taste and, after 20 mins, add the raisins and pinenuts. This recipe serves 4. 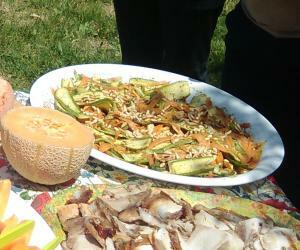 A very refreshing summer salad devised by Iole on our France & Italy tour in September. 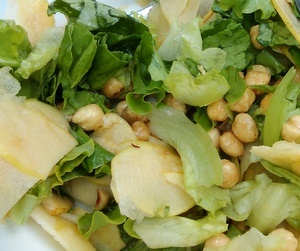 Simply shred lettuce and finely slice crispy apples and throw in some whole hazelnuts. If you have a mandolin you can make the apple slices super thin, and leave the skin on. Then dress liberally with good olive oil, apple vinegar and salt and pepper. It makes for a great salad with contrasting textures and flavours. 1. Eggplants/aubergines need to be sliced about 1cm thick in rounds, tossed in flour and deep fried until golden. 2. For the tomato sauce (Napoletana) put a lot of extra virgin olive oil in a saucepan with a piece of garlic. 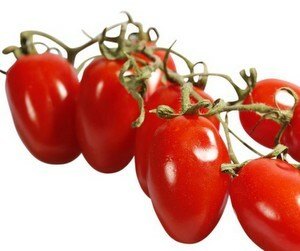 When hot add a can of whole peeled tomatoes, add a little sugar and salt and cook for about 20 minutes. When cooked add fresh basilico. 3. For the Pappa Pomodoro you will need to cube some old bread and dry out further in the oven, this is to be added to the tomato sauce and combined until smooth. 4. 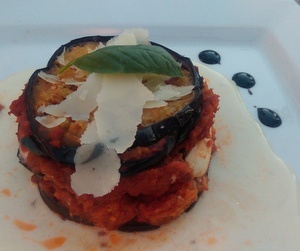 Take a metal ring mould and place the first layer of eggplant, then pappa pomodoro and keep layering until to the top of the ring. In the last place a slice of bufala mozzarella. Remove the ring 'e voila' ! A batch can be made in advance and kept in the fridge until needed, then just zap in the microwave to reheat. For the cheese sauce heat cream in a saucepan and add gorgonzola cheese, rosemarino ...do not boil or the sauce will split. Serve underneath the eggplant! In a large casserole slowly simmer 2 finely chopped onions in olive oil with a little rosemary and sage and thyme if you happen to have it. Cut into small cubes about 200 grams of lean beef and add to the mixture. When well browned, add a glass of red wine. Meanwhile, cut into small pieces two or three peeled potatoes. Add to the meat a tablespoon of cornstarch dissolved in cold water, add the potatoes, some salt and a generous sprinkling of paprika, a little of a hot spicy one, but more of a sweeter one, like the Hungarian Sweet Paprika which is typical in goulash recipes. Cook slowly adding good beef stock and water until the pieces of meat are very tender. 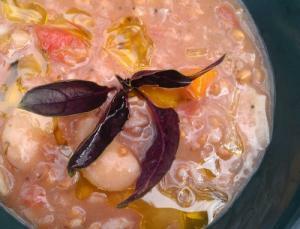 This is one of Cinzia's recipes which she made on our inaugural tour of the new Lucca, Volterra and Elba trip. 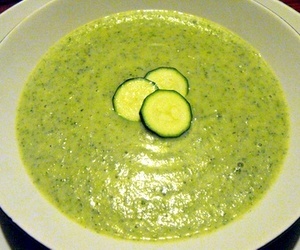 It is made with finely sliced raw zucchini and carrots. If you have a mandolin you can achieve lovely thin slices but, if not, a potato peeler is just as good. On top are some toasted pinenuts and the salad is dressed with pesto mixed with a splash of water and olive oil to thin it down a little. Very simple but satisfying and tasty at the same time! See a good recipe for pesto further down the page! This is an antipasto we always enjoy at Ristoro di Lamole, high in the Chianti hills of Tuscany, which is unbelievably delicious! (For Four) Chop and cook in olive oil 4 sweet red onions (add a teaspoon of water to stop them burning) and add a little salt and pepper. Separately prepare a fairly thick bechamel sauce with 1/2 litre of milk, 40g of butter, 20g of fresh black truffle or a drop of white truffle oil and 30g flour. 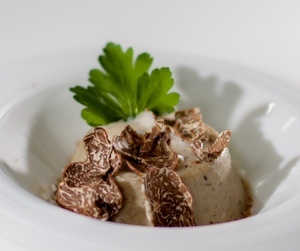 At the restaurant they use butter blended with fresh truffle or a dash of truffle oil to give the same flavour. Wizz the cooked onions in the blender and add the bechamel with two tablespoons of grated parmesan cheese. Pour the mixture into aluminium moulds prepared with butter and flour to prevent the flan from sticking. Place the moulds on a baking tray with 1 cm of water in the oven dish, and cook at 150° for around 30 mins. After cooking allow the flans to rest before plating up. To really finish the dish, generously grate fresh black truffle on top of each one. 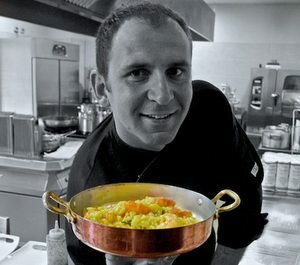 This recipe belongs to Alberto at Il Sigillo restaurant near Saluzzo in Piedmont. Northern Italy is famous for its risotto dishes, where the conditions along the Po Valley are perfect for rice cultivation. The make the stock brown chopped onion, celery and carrot in olive oil with veal bone marrow, cover with salted cold water, bring to the boil and simmer for around an hour. Peel the pears, and cover them with the Spumante. Add the saffron to infuse in the liquid and cook in the oven for 10 minutes at 180°. In a large pan brown the chopped onion in olive oil, add the rice and stir for a couple of minutes. Add a good dash of the white wine and allow it to evaporate. Then cover the rice with the hot stock and let it continue to cook for around 10 minutes. Cube the pears and add them to the rice and let them cook for a further 5 minutes. Turn off the heat and allow the blue cheese to melt into the rice with a little butter and black pepper. Allow the risotto to rest for one minute in a copper pan before serving. Put in a blender the basil leaves, pine nuts, chopped garlic and a little salt. Add a handful of the grated parmesan and pecorino and blend again. Pour the mixture into a bowl and add the olive oil until you have an almost creamy consistency. 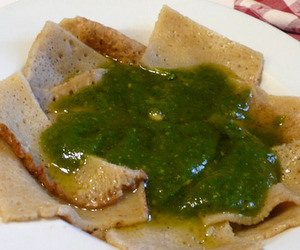 In Pontremoli they eat it with their unique pancakes known as "testaroli" but it is delicious on fresh pasta too. 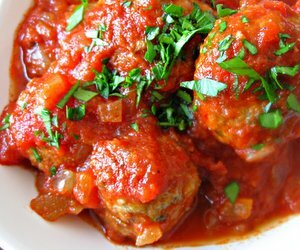 This traditional meat balls are one of the ancient recipes from Abruzzo we learn how to make when we stay at the Albergo Sextantio in Santo Stefano. Mix together well all the ingredients in a bowl with your hands and add the egg at the end to bind them all together. Roll them individually in the palms of your hands until they are small round balls. 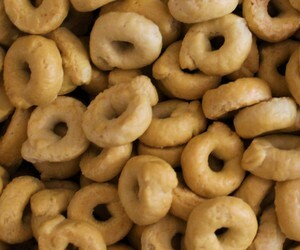 Fry them in hot olive oil and try to get them evenly golden all over. You can eat them like this or cover in rich tomato sauce. This is a favourite from Rundell's Alpine Lodge up in Dinner Plain in the heart of the Victorian High Country - a great base for our High Country hikes with a fabulous restaurant. Combine milk, cream and sugar in a saucepan. Cut and scrape vanilla bean, add to the mix and bring to the boil. Remove from heat. Add gelatine and stir until dissolved. Strain liquid, then pour into 6 glasses. Refrigerate overnight. For the praline, mix sugar and water in a saucepan. Cook for 5 minutes or until sugar has dissolved. Bring to the boil for 5-7 minutes, until golden brown. Add almonds. 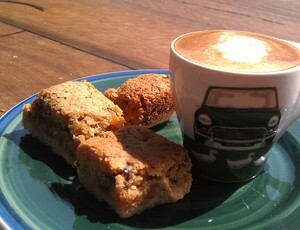 Stir and pour into a lined baking tray. Allow to cool. Once set, blend in mixer to a large crumb texture. To serve, cut the strawberries into halves. Place into bowl with shredded mint and schnapps to taste. 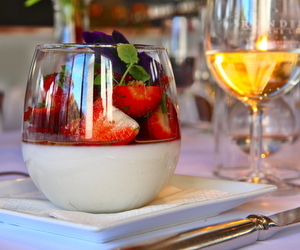 Add mix to panna cotta glass. Sprinkle with praline to finish. 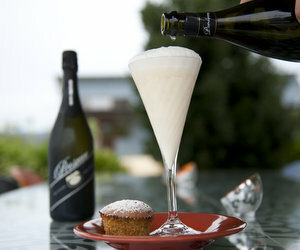 This recipe was given to us by Gwenda at Casa Luna in the King Valley. Our Victorian Alps and Vineyards tour stays here and we always enjoy Gwenda's great cooking, influenced by her passion for all things Italian. The recipe originates in the north of Italy but is popular all over the peninsula. Place all ingredients in a blender and process till smooth. Pour into champagne flutes, to about two thirds full, place on a small plate, and top with a chilled King Valley prosecco at the table. Lovely with an accompanying sweet treat. Gwenda usually serves it with little Sicilian pistachio sponges. Her advice is to try to avoid having two, unless you are walking home!! This recipe is from Tani Eat & Drink in Bright which is an award winning restaurant we use on our Highlights of Mount Buffalo tour. Pre-heat BBQ or flat grill to a moderate temperature. Mix all ingredients together (leave 5g of bonito for garnish), divide mixture into four, pour one part of the mixture onto a flat grill/bbq with 1tbls of oil. Shape the pancake using two spatulas; repeat this process with the remaining mixture. When the pancake has formed structure it is time to turn and cook for a further four minutes or until it is firm but not dry. 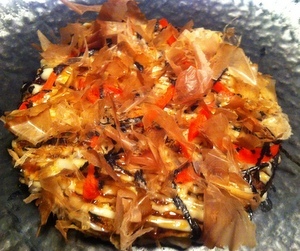 Place the pancake on a plate, garnish with Japan’s mayonnaise, okonomiyaki sauce, red pickled ginger and bonito flakes. As the heat rises off the pancake the bonito flakes will start to move. Heat the ingredients together and then thicken with the corn flour, allow sauce to cool. These two easy starter recipes were cooked by Mick and served on our Lazy Lunch menu in February 2015. In the food processor wizz the mortadella until it becomes a paste. Add a sprinkling of pepper and the lemon juice. Place in mixing bowl. Add 1/3 cream and stir. In two other bowls separately whisk the cream and the eggwhite until they both peak. Fold whipped cream into the mortadella mix and then fold in the egg white and serve with squares of fresh foccaccia. This is the signature dish of the chef Massimo Bottura at the Osteria Francescana in Modena. We tried it there and loved it! Mix together all ingredients in bowl and refrigerate. Shape into small bite-size balls and fry in pan until golden brown all over. Make the polenta as per instructions and add a knob of butter. Flatten out onto tray 1.5 cm thick. Using a cutter, make circles 4-5 cm across. Heat olive oil in pan and fry until golden brown on both sides. 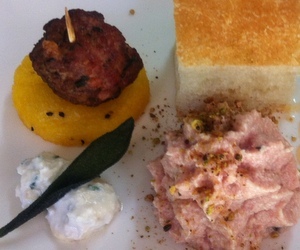 To serve, place pork ball on polenta and serve with creamy horseradish sauce. 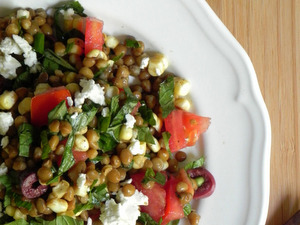 This very easy salad is both filling and nutricious as lentils are a great source of protein. All you need to do is mix tinned Italian lentils (or you could use Puy lentils) with crumbled feta cheese, a finely chopped red onion, some chopped sweet cherry tomatoes, a few leaves of basil and dress the ingredients with olive oil and red wine vinegar. If you have other green leaves you could also add those - rocket or fresh baby spinach would work really well. Finely chop the veg and fry off in some oil and add the rosemary and garlic. When soft, add the spelt and a generous splash of wine. Add the tinned tomatoes, bay leaf and about 500ml water. Bring to the boil and then simmer for 40 mins - the spelt should be "al dente". You may need to top up the water. Check for seasoning and add salt and pepper. 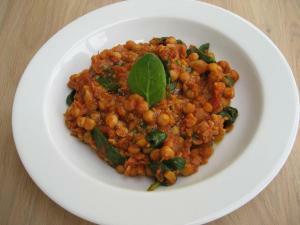 If you like you can add cannellini beans or some brown lentils. Serve with a drizzle of good quality olive oil. So simple but light, crunchy and delicious! This is great if you have a mandolin slicer so that you can make wafer thin slices of fresh apple and zucchini (courgette). The key is the dressing which is made with extra virgin olive oil, apple vinegar, and finely chopped fresh mint, giving the salad a really clean and refreshing flavour. Salt and pepper too to taste. Lovely at the time of year when lots of fresh mint is growing in the garden! This is a very easy light summer salad. It's made with fresh baby spinach leaves, chopped cooked beetroot, feta cheese, cherry tomatoes, (or you could dice cucumber) and a generous sprinkling of mixed seeds which gives the salad a nice texture and crunch. 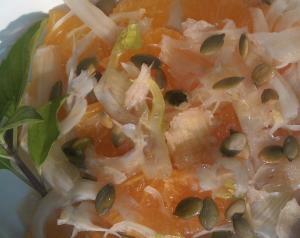 Sunflower, pumpkin and sesame seeds for example will all work a treat. 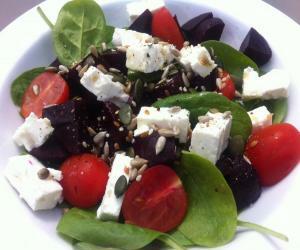 We used barrel aged feta for a really intense flavour and dressed the salad with hemp oil to make a super healthy! Finely dice onions, celery and carrots and cook until soft in some olive oil. 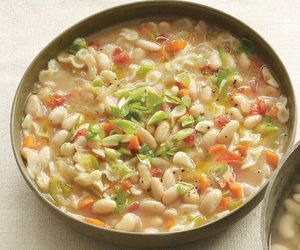 Add some pre-soaked cannellini beans and some good vegetable stock. Let the soup bubble slowly so that the flavours have a chance to blend together. If the soup looks too watery you can add a handful of spelt - spelt is an ancient grain which the Italians call "farro" but which is excellent to thicken soups and add another layer of texture. The spelt grains usually take about 20 mins to soften up but help to make a very satisfying result. Tiny pasta shapes could also be added. Season well with salt and pepper and fresh herbs if you have them - sage and rosemary work well. A few flakes of pepperoncino also help to boost the flavour. 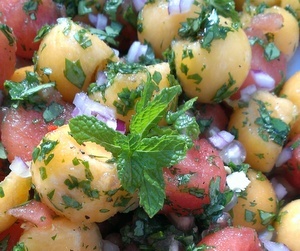 This is a very refreshing salad on a hot day. Use a melon baller to chop up equal quantities of water melon and rock (cantaloupe) melon. You can also add cucumber and some finely chopped red chilli. 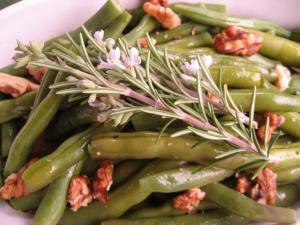 Garnish with mint leaves and dress with verjuice or a mild flavoured vinegar, sea salt flakes and ground black pepper. If you like, crumble some feta cheese over the top. Using thin slices of succulent cold roast beef, mix them with baby spinach leaves and then freshly grate some horseradish root on top just before you eat it. This is something we have come to enjoy on our travels in Slovenia and it gives the salad a real kick. We added some roasted asparagus spears and a few fresh peas, and drizzled with a little olive oil. Delicious! 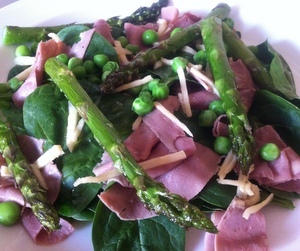 This salad looks great if you build it upwards on the plate rather than mixing it all together. At the base is some cooked bulgur wheat doused in lemon juice, olive oil, salt and pepper while still warm, to absorb the flavours. 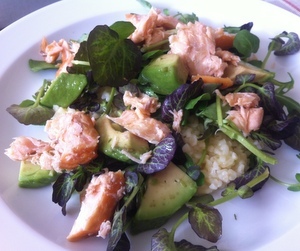 On top lay some watercress, sliced avocado and bite-size pieces of smoked trout and cover again with a little lemon juice and a good slug of olive oil. It is really filling and gives you a good energy boost - especially if you're hiking in the afternoon! This is a surprisingly good mix of flavours and a very satisfying salad for lunch or a light supper. Shred roasted or grilled chicken and dice a ripe mango into little cubes. 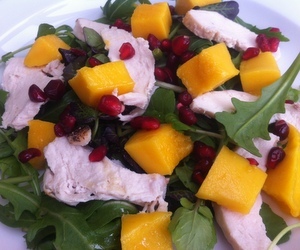 Serve on a bed of rocket leaves and sprinkle over some pomegranate seeds for a little colour and texture. A lovely dressing for this salad is a blend of olive oil, lime juice, a red chilli finely chopped and seeded and some roughly chopped coriander leaves. This is a crunchy and colourful salad and full of healthy nutrients! 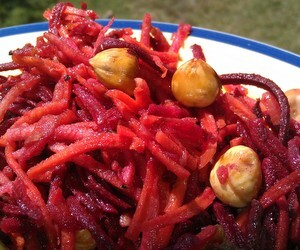 If you have a food processor it takes seconds, but the recipe calls for finely shredded raw carrot along with shredded cooked beetroot and crisp crunchy fresh apples. To add even more crunch we like to add a few toasted hazelnuts on top. A great dressing for this is olive oil, apple cider vinegar, a squeeze of lemon juice and a little honey for sweetness. 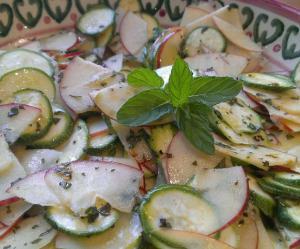 This fresh and cleansing salad takes seconds to make - especially if you have a mandolin to hand! 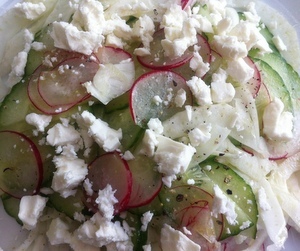 All you need is a bulb of fresh fennel finely sliced with thin slices of cucumber and pretty pink radishes to add a little colour. Liberally crumble over the top some Greek feta cheese. Season well and dress with good white or red wine vinegar and extra-virgin olive oil. It is very light but satisfying at the same time! 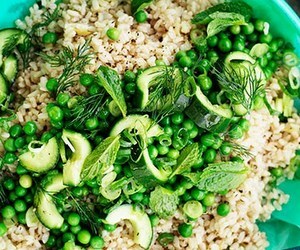 Mix together cooked and cooled brown rice with chopped cucumbers, peas, grated zucchini, spring onions and lots of coarsly chopped flat-leaf parsley, fresh mint and dill. To really pack a punch with flavours you can dress the rice a little while before you eat it and mix the veg in at the very last moment. This will keep them nice and bright green. For the dressing use good olive oil, white wine vinegar, crushed garlic and the grated rind and juice of two lemons. Season with a little salt and freshly ground black pepper. Find a good selection of different tomatoes - ranging in size and colour - such as beef tomatoes, baby plum tomatoes, cherry tomatoes and yellow or orange ones if possible. 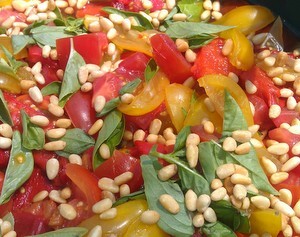 Roughly chop them and serve on a wide platter with lots of fresh basil leaves and some lightly toasted pinenuts. 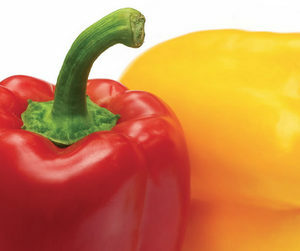 To add another flavour you can roast or grill red or yellow capsicum, peel the skins off, and slice into the salad. Drizzle with good quality extra virgin olive oil and little salt and freshly ground black pepper. Cook all the grains separately, until they are al dente, and allow them to cool before blending them together. You can garnish the salad if you wish with fried shallots. These ingredients above make up the base, combine them all well and press down into a shallow rectangle tin with a lip, line it with greaseproof baking paper initially. Prick lightly with a fork and place in preheated oven at 180c for 12 mins. Then remove ready for the topping. Carefully spread mix all over the base with a spatula. Continue cooking for another 12 mins or until set. Cool and slice. 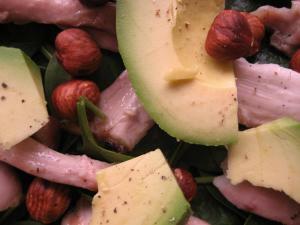 First up is an incredibly simple but tasty green salad, using tender baby spinach leaves, ripe avocado, grilled or cooked chicken and toasted hazelnuts. This is really delicious served with a simple dressing of good olive oil and balsamic vinegar and a little salt and pepper, and is a complete meal in itself. Toasted pine nuts would also be a tasty alternative. 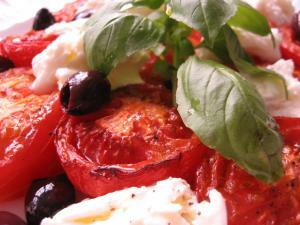 An interesting twist on a tomato and mozzarella salad but in this one the tomatoes are slow-roasted first. Often in the winter months tomatoes tend to be short on flavour, but once slow-roasted with herbs and garlic the sweetness is intensified and the flavour enhanced. If you can find buffalo mozzarella to tear into strips then this will be the most delicious option, and you can add a few juicy black olives and some bright green basil leaves. 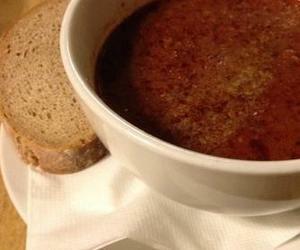 This soup really is a meal in itself and uses lots of lovely Moroccan spices. The flavours in this are totally different to European tastes and full of eastern promise ... Chickpeas are protein-rich and excellent fuel for hikers and this soup could really fill you up for a day's walking. Sauté the onion and garlic in the olive oil on a low heat for about 10 minutes, and add the spices and sauté for about a minute more. Add the tomatoes, chickpeas, stock and sugar and a little salt and pepper. The chickpeas should be just covered by the amount of liquid. Simmer for around 45 minutes. Remove pan from heat and mash some of the chickpeas in the pan using a potato masher. Put back on heat and stir in the spinach leaves until they wilt. Serve with a drizzle of olive oil on top. If you like your soup a little thinner you could add more stock after you have mashed the chickpeas. 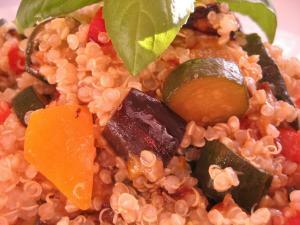 This recipe is a salad of roasted vegetables and quinoa. Quinoa is a wonderfully nutty high protein seed, originally from South America, which is filling but very nutritious. The vegetables to chop through it can be anything you can find such as red and yellow peppers, courgettes, eggplant/aubergine or tomatoes. Drizzle with a bit of good quality olive oil, some sea salt and a little lemon juice. You could also make this with spelt - an ancient grain known in Italy as "farro", but equally good in salads. 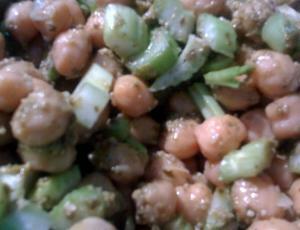 This is a very simple mix of chickpeas with chopped celery which has a lovely crunchy texture. As a dressing for this we used fresh pesto which gives a delicious garlic and basil twist to this simple salad. Top and tail the beans, cut in half and boil or steam until they start to soften but still have a little bite to them. Rinse under ice cold water to maintain the colour. Sprinkle over chopped walnuts and dress with good extra virgin olive oil and some lemon juice, salt and pepper. If you like garlic, finely chop a clove and add, and fresh rosemary is delicious too. Halve a selection of red, orange and yellow capsicums (peppers) and scorch the skin under a hot grill. When black and charred remove the skin and slice the soft peppers into thin strips. 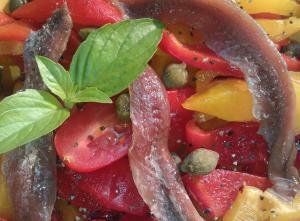 Add some delicious salty anchovies and a few capers and drizzle with good extra virgin olive oil. Peel and slice the oranges into thin segments. Finely slice the fresh fennel - if you have a mandolin you will get good results or a potato peeler is useful too. Mix together and let the juice become the dressing with a little extra olive oil, salt and pepper. 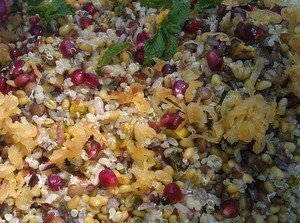 Sprinkle with sunflower seeds or toasted pine-nuts to finish off. Peel and slice the pears and cover with lemon juice to maintain the colour. 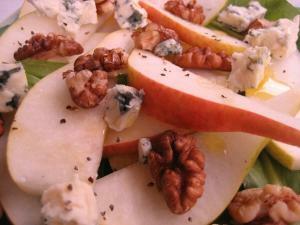 Add the chopped walnuts and small cubes of blue cheese such as gorgonzola. Dress with good extra virgin olive oil, salt and pepper. Serve it on a bed of chopped red radicchio or some peppery rocket to really bring the flavours out.